DutchCrafters Amish Patio Recycled Poly Half Round Table is the perfect choice for a smaller space with some poly bar stools. 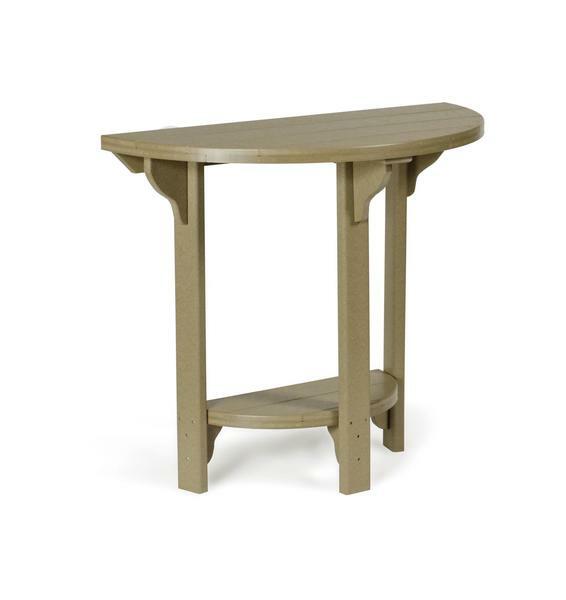 Choose from our wide variety of outdoor bar stools to go with this pub table. This poly table is made by the Amish, made in America! DutchCrafters Amish Made Patio Poly Half Round Bar Table is the perfect choice for a smaller space with some poly bar stools. This poly table is made by the Amish, made in America from recycled milk jugs. Please call one of our Amish furniture specialists for assistance. They are happy to help in anyway that they can! This Amish Patio Recycled Poly Half Round Table usually ships within 2-4 weeks of purchase.